I have found the PLAC Test / LpPLA2 Test very useful in predicting who has and doesn't have coronary artery disease in the past 3 years of using this. I'm glad the FDA now agrees. The LpPLA2 test is also useful in guiding a functional medicine method to treating Alzheimer's (using for example CDP Choline or CerefolinNAC). The U.S. Food and Drug Administration today cleared a new screening test that predicts a patient’s risk of future coronary heart disease (CHD) events, such as heart attacks. FDA cleared the test for use in all adults with no history of heart disease, but studies submitted by the company and reviewed by the FDA show that the test is better at discerning this risk in women, particularly black women. The PLAC Test for Lp-PLA2 Activitymeasures the activity of lipoprotein-associatedphospholipase A2 (Lp-PLA2) in a patient’s blood. Lp-PLA2is a biological marker for vascular inflammation, a condition associated with the buildup of plaque in the arteries that supply blood to the heart. Over time, this buildup can result in a narrowing of the arteries and lead to CHD. Patients with test results that show Lp-PLA2activity greater than the level of 225 nanomoles per minute per milliliter (nmol/min/mL) are at increased risk for a CHD event. Patients with test results below this level are at decreased risk for a CHD event. According to the U.S. Centers for Disease Control and Prevention, heart disease is the leading cause of death in the United States for people of most racial/ethnic groups, including blacks, Hispanics, and whites. People of all ages and backgrounds are at risk of heart disease and around the same number of men and women die of the disease each year. The most common type of heart disease is CHD, killing more than 385,000 people annually. Almost two-thirds of women and half of men who die suddenly of CHD have no previous symptoms. The FDA’s review included the PLAC Test for Lp-PLA2 Activitystudy, a sub-study from the National Institutes of Health’s national Reasons for Geographic and Racial Differences in Stroke study that targeted a balanced enrollment of gender and race. In the PLAC Test for Lp-PLA2 Activityvalidation study, researchers performed the test on 4,598 participants ranging in age from 45 to 92 with no history of CHD. The participants included 41.7 percent men and 58.3 percent women, and 41.5 percent blacks and 58.5 percent whites. Researchers followed the participants over the course of several years and recorded who experienced a CHD-related event. The median follow-up time was 5.3 years. The study showed that participants with test results higher than 225 nmol/min/mL had a CHD event rate of 7 percent, while patients with test results below that level had a CHD event rate of 3.3 percent. The FDA requested data analyses of additional subgroups, including black women, which showed that black women experienced a higher jump in the rate of CHD events compared to other participants when Lp-PLA2levels were higher than 225 nmol/min/mL. As a result, the test’s labeling contains separate performance data for black women, black men, white women and white men. 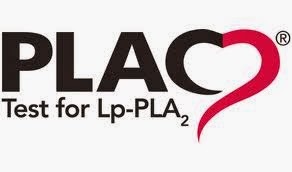 The PLAC Test for Lp-PLA2 Activityis manufactured by diaDexus, Inc., based inSouth San Francisco, California.